Creativity begins here. Get things MADE. 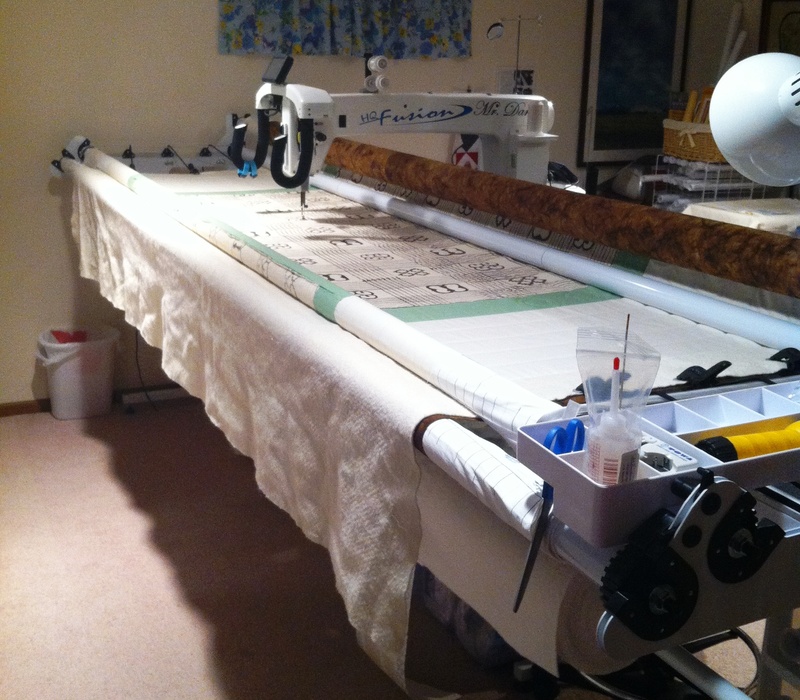 Every long arm quilter will have slightly different requirements for preparing quilts to be loaded on their machines. Whether or not you choose to send your quilts to us for finishing (or come and finish them yourself), we hope that you will find these tips helpful. Anything you do to help make your quilt as trouble free to finish as possible will be time well spent for both you and your quilter. Many quilters charge extra for performing these services for you, so you can often save money by doing some simple preparation in advance. Quilting on a long arm frame is very different from quilting on a domestic machine, and as a result, you’ll find that there are many additional steps and watch-outs for you to prepare successfully. The good news is that you never have to baste again, and once you get the hang of it, preparing your quilts will come more naturally. Pin your quilt backing to the top and bottom backing zippers, and the quilt top to the bottom quilt top zipper. Taking care of this before you arrive at the studio will maximize the use of your rental time. If you are using packaged batting, remove it from the package 1-2 days before your rental and unfold it completely, spreading it out to help the folds relax. If you forget to do this, you may try fluffing it in the dryer on low for 20-30 minutes. If you are using packaged batting and it is significantly larger than your backing, please trim it to the width of your backing, making sure that they are both 4-6″ larger than your quilt top on all sides. Alternatively, you can purchase batting from us. It’s available by the yard in a variety of fiber content, weight, and color! We proudly carry Quilter’s Dream and Winline battings. Before adding borders to your quilt, give the top a good pressing before measuring for borders. Quilts can sometimes stretch near the outside, and if you use those measurements for borders, you’ll be adding in extra fabric that leads to wavy borders. Do not leave it to your quilter to “quilt it out” – instead, measure correctly for your borders to bring your quilt back into square. To add straight borders to your quilt, lay your quilt on a flat surface, and measure the length of the quilt at the center. This center measurement represents the true size of your quilt. Write down this measurement, and cut both side borders to this length, preferable on the lengthwise grain (which doesn’t stretch.) This will add strength & stability to your quilt top. 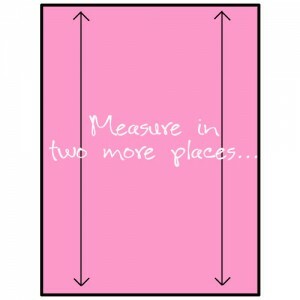 Measure your quilt in two other places, closer to the outside edge than the center. 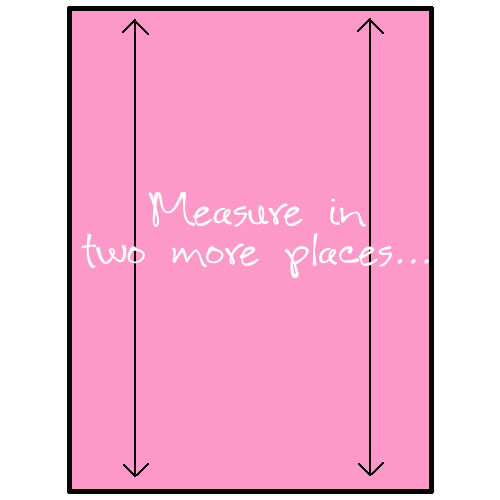 Compare this measurement to the measurement you took at the center. Is the difference smaller than 3/4″? If so, then you can probably ease in the difference when you attach the border. If it is larger than 3/4″, then you should check your piecing. You may need to adjust a couple of seams in the outside blocks to bring the difference under 3/4″, either by letting the seams out, or by taking them in. If the difference is more than a couple of inches though, you will need to address other seams in the quilt top itself, so that you are not making the problem worse. The best thing to do is to check your quilt for square as you are piecing it! Fold the quilt in half and mark the center of each side with a pin. 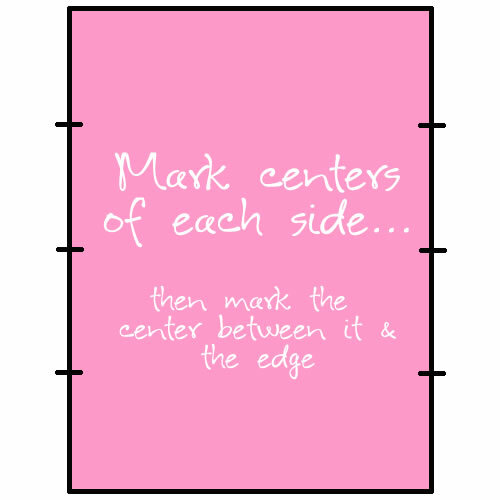 Next, fold each edge to the center, and mark that fold with a pin. You will have three pins on each side of the quilt. Repeat this same step on each border. Pin the borders to each side, matching the three pins and the outside edges. Continue pinning the borders to the quilt, distributing any difference between the quilt top length and the border length as you pin. To stitch the borders onto the quilt, you want whichever side had the longer length to be directly on top of your feed dogs. So for example, if the outside edge of your quilt top was longer than the center measurement, sew with the quilt top toward the feed dogs. If the outside edge of your quilt top was smaller than your center measurement, sew with the border toward the feed dogs. This will make your feed dogs do the work of easing in the extra fabric, without puckers or pleats. Sew the borders to the quilt, and press the seams toward the border. For the top and bottom borders, measure the width of the quilt at the center. Cut the top and bottom borders to this length, as you did for the side borders. Repeat all the same steps as you did for the side borders – measuring the quilt in two more places, determining whether you can ease the difference or need to adjust the seams, pinning the borders to the quilt, and stitching with the longer side toward the feed dogs. Now that you’ve taken the time to do this, by squaring your quilt top and measuring for borders correctly, any additional borders you want to add should be easier, and not require as much easing. However, you will still want to repeat these steps for as many borders as you are planning to add, to make sure you are not cutting borders the wrong length or piecing your quilt out of square. Your quilt top must be square to be loaded and quilted successfully. 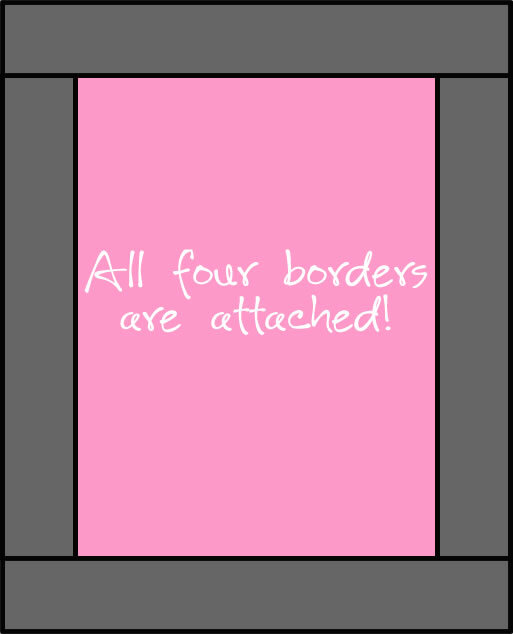 If you have added borders to your quilt as shown above, this will not be an issue. 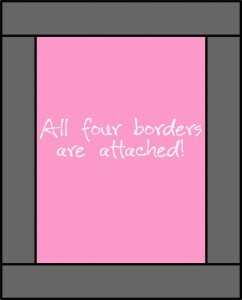 If you did not add borders or have done so incorrectly, this could cause problems. Measure the opposite sides of your quilt to see how closely they match. If the opposite sides are off by more than 1-2″, you MUST correct this before sending it to be quilted. If your quilt is wonky to begin with, most likely it will come back that way as well. If you want to embellish your quilt top with beads, buttons, or other objects, wait until the quilt comes back from the quilter. We cannot quilt through these items and they prevent us from loading the quilt so that it is flat & square. Press your top flat, from the back, so you can direct the seams correctly. Trim any loose threads, especially those that may show under lighter areas of your blocks. Inspect your quilt top for any seams which have come loose, and repair them. We quilt at high speeds, and any holes or open seams can catch in our machine’s foot and rip the quilt. You don’t want that! Stay-stitch seams that are on the edge of your quilt. Stay-stitching is simply adding 3-4 stitches across the seam, about 1/8″ from the edge, to keep the seams from pulling apart. If your top does not have a border or the border is completely pieced, you could also baste around the entire perimeter of the quilt. Your quilt top will be stretched and rolled when it is loaded on the machine, and you don’t want those seams coming apart in the process. Mark the center of your quilt top at the top and bottom with safety pins. If your quilt has a definite “top” edge, pin a note to the quilt there as well. That will help the quilter determine the best way to load your quilt so that the design will face the correct direction. If your quilt top has embroidery, applique, or folded fabric techniques such as prairie points or pleats, be sure to let your quilter know whether it is OK to quilt over them when you discuss the quilt design. DO NOT layer your quilt top, batting, and backing together or baste them in any way. The quilt gets loaded on three separate roller bars, and we cannot load the quilt if it is already basted, especially if it has been basted with pins. No matter what, your backing MUST BE 4-6″ larger than your quilt top, on ALL sides. So if your quilt top measures 50″ x 50″, your backing must be at least 58″ x 58″. The extra backing is needed because of the loading process, for the quilter to perform thread tension testing, and also to insure the machine doesn’t bump into the side clamps that are supporting your quilt. The larger the quilt, the larger this allowance should be. More is not better. If your backing is too large, the extra fabric just gets in the way. Try not to make backings that have to be center-matched with the center of the quilt top. On a home machine, you typically quilt from the center out, but on a long arm, we quilt from top to bottom. Trying to perfectly match a quilt top with the backing takes extra time & skill, and depending on the type of quilt and design, it may not even be possible. Ideally, you will have a backing from one single width of fabric. Some quilters (like us!) have a limited selection of wide quilt backs for you to choose from, or you can order them online. If you are piecing your backing, horizontal seams are better than vertical seams, because of how the quilt is loaded on the rollers. Try not to have a vertical seam running right down the center of the quilt. Off-set this seam to one side, or better yet, piece the backing so that you have extra on both sides and a larger piece in the center. Remove selvage edges before piecing (unless the selvages are on the outside edge). Selvages are the tightest weave of the fabric without any give, and leaving them on can create puckers and inconsistent seams. They can also cause pulled threads in that area if the needle hits them in the wrong place. Use a 1/2″ seam allowance when using large sections of fabric. However, if your backing is scrappy, normal 1/4″ quilt seams are fine. Press seams open whenever possible. The extra bulk created when you press seams to the side can cause skipped stitches and also hinder the quilt from rolling on to the frame evenly. Press your backing flat, from the back, so you can direct the seams correctly. Mark the center of your backing at the top and bottom with safety pins. 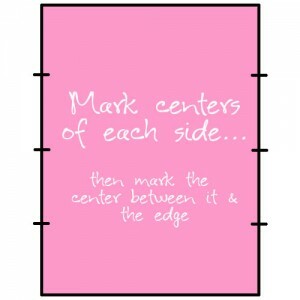 You cannot mark the center if the backing is not square! If the backing has a definite “top” edge, pin a note there as well. That will help the quilter match the backing to the top in the correct orientation. Most quilters will have a variety of affordable batting for you to choose from. A lot of quilters have taken the time to experiment with different kinds of batting to find what combination works best for different applications, and they can help you choose the right batting for your project. I carry Legacy Batting by Pellon, in 15 varieties of fiber contents and weights. My offerings include 100% Cotton, 100% Wool, 100% Poly, 100% Bamboo, several Cotton/Poly Blends, Cotton/Bamboo Blends – far more variety than you’ll find in a local craft store. I also have a small supply of Warm & White. If you do decide to provide your own batting, make sure that it is at least as large as the quilt backing. There’s nothing worse than running short of batting, except running out of backing fabric! Quilting thread for a long arm machine is likely very different from the thread you see locally in craft or sewing stores. 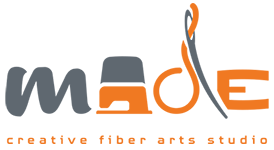 Long arm machines are industrial machines, and use different needles as well as threads that are specifically designed for high-speed quilting. While it’s true that any machine should be able to run any thread, it takes time to find the right combination of needle, tension, and speed for every new combination. That’s why a quilter will usually settle on one type of thread to use on the majority of their quilting jobs. If you have a specific thread you want to use that isn’t what the quilter typically works with, discuss it with them to see if they can match the color and weight against a thread they already use, or to see if they are willing to use your thread on their machine. I use Superior Threads almost exclusively, but I also use YLI threads on occasions when I need a particular color match. Both companies have an excellent line of threads in different weights and fiber content, and I am quite sure that you will be pleased with the variety and selection available. I’m also happy to special order any thread for your project that I do not currently keep in stock. If you are shipping your quilt to someone for quilting, do not stuff it unceremoniously into a box. It’s one thing for the quilter to press out folds that happened in shipping, quite another to completely press an entire quilt top and backing again. Fold the quilt top and backing separately before packaging the quilt components for shipping. It’s a good idea to place the pieces in a large plastic sack, along with a copy of your contact information, in case the quilt gets separated from the box. Make sure you discuss with your quilter whether or not you want them to trim off the excess batting & backing before sending it back to you (I don’t unless asked.) Make sure your quilter knows about any special requirements or requests that you have. This experience should be a partnership between you and your quilter, so if you don’t know something or aren’t sure, please ask! Good communication makes great results! MADE is open by appointment only. The posted hours are times that appointments are available to schedule, not times the studio is open. Please view our calendar or call to see if dropping in is possible.